In the Mary-el, the Majors I - X and courts are placed on the 10 sephiroth. She says the Fool is representative of the entire Tree. In her entry about Strength, she says 11 equates to 1 and the start of the cycle again, but with more knowledge of oneself. But I haven't seen majors beyond X specifically associated with the sephiroth, so I'm guessing only I - X are? About Justice, she says "[VIII] Justice and [VII] Chariot are Netzach  and Hod ," (numbers added by me) but I assume she just means "the Chariot and Justice are Netzach and Hod". She refers to the "dark and remote" H. Priestess and the nurturing Empress as sitting atop their pillars of Mercy and Severity. Is she referring to the merciful/unconstrained aspects of the Priestess, which is on the pillar of mercy, and the severe/organizing aspects of the Empress which she has at Binah on the pillar of severity? I haven't seen an instance where she equates a specific minor with a sephira, except possibly the 9s. For the 9 of Wands, she says it goes to the right pillar, though Wands as a suit are attributed to the center pillar. IX the Hermit is on the middle pillar, so I'm not sure why it would be the right pillar for the 9 of Wands? She also says in that same entry (for the 9 of Swords) that the 9 of Disks is at Malkuth. Does she mean for there to be a Qabalistic system to the minors? Or am I trying to find a Qabalistic system when I'm meant to stick to pips as trumps? Phew. Typos probably abound, but I'm stopping here. Thanks for any thoughts if you waded through all that. This is quite an old thread, but I hope I can still be of help - if you have already found your answers, then maybe to someone else who is studying. The attributions that you have noted in your ToL come from the part about the court cards, and that is strictly from that part of her book. So she ties the first sephiroth with the four court cards (and therefore, with the elements, and everything else. She also states in the book that this is -not- a traditional way of attributing to the elements, but she also explains the logic. On that graph (and the attributions) we can also follow the logic that if the Magician is Kether (1), then so is Strength (11), according to that logic, also The World would be (21). 12 then is Chokmah (Hanged Man), Death is Binah etc. As for the majors in standard - each major is joined with a Hebrew letter (Hebrew/Phoenician) and she is pretty much sticking with the basics here. All the majors respond to a Hebrew letter, ergo also a path between the sephiroth. However, she also ties the minor arcana together with the majors (so the Sevens represent the Chariot and Netzach, the Eights represent Justice and Hod, the Sixes Lovers and Tiphareth etc). She goes further to imply that the court cards are majors XI, XII, XIII and XIV. So the question about "which majors are attributed to minors" is inaccurate in the sense that all the majors carry aspects of their respective sephiroth numerologically, e.g X is the wheel, the Tens are the wheel, and Judgement is the ultimate wheen (the Aeon has ended and begun again). This is more about numerology and gematria than it is about majors and minors. What she does here, though, is considering 14 to be 4 enhanced, instead of five (1+4). Netzach and Hod are Chariot (7) and Justice (8). Regarding the Trinity and the different feminine aspects of HP and the Empress, one must go a bit deeper into Kabbalah. So alright, Severity and Mercy seem to be rather obvious for Severity going to HP and Mercy to Empress (due to our natural instincts). But what is meant here is the larger concept of Kabbalah. So in Binah, we have the "Divine Mother" (who is the Empress), and she sits upon the pillar of severity (Judgement). Binah is the Womb, and the pillar is of feminine energy. Chokmah represents the masculine energy, but masculine in the divinity, so the Divine Mind (e.g God, Virgin Mary, Holy Spirit could be Kether, Binah, Chokmah). The difference is in the emotional and mental response. So think about it once more - Chokmah (HP) represents the spark, the seed of life, the force of life which yet has no form. Binah accepts life in its womb (the archetype of Binah is, indeed, the womb); but insodoing, it also consumes the eternity and sets limits and boundaries on life, beginning the journey to Death. Here you can also see the logic of the link between majors and minors - the Empress accepts the seed of life in her womb, and guides it to Death (the next 3, 13). The Fool is -not- the Tree of Life. The Fool is Ain Soph, the light (on a ToL graph you will usually see it above Kether). But at the same time, we have the Abyss below Malkuth. As White puts it herself, Malkuth and Kether are pretty much the same thing, depending on the point of view - same with the Fool, he can be in the Ain Soph or in the Abyss. The tree represents the fools journey, not himself. 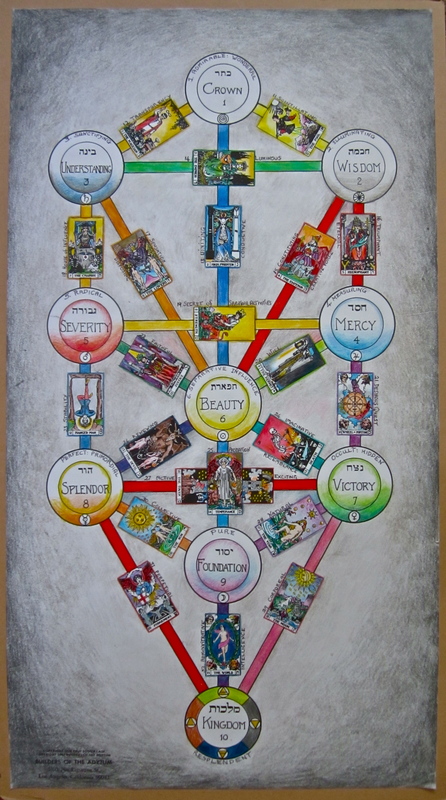 The traditional kabbalistic system for the minors is to attribute the sephiroth with their corresponding minors, and this is what White has done as well. She is just expanding the take with other attributions (three = three pillars, trinity etc).